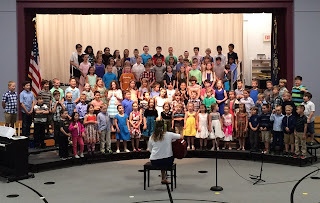 Tuesday night was the annual Spring Concert at my kids’ elementary school. Students dressed up, many to a degree reserved for very special occasions in an increasingly casual world – button-down shirts, pretty dresses, fancy shoes. Parents snapped pre-show photos, and an adoring audience filed in to find seats as the band warmed up behind the curtain. It’s a scene repeated at countless schools in myriad places, and one my children look forward to each May. During my their first ever school concert, my oldest daughter, the girl who clung to me tearfully each morning of kindergarten, stood front and center on the stage risers, singing and shimmying to the “Penguin Polka” with big confidence. I considered this transformation of shy little girl to happy performer some kind of school concert miracle. It’s been a few years since I’ve been the mom of kindergarteners (although I can still sing the Penguin Polka). The big kids from my children’s first concert are high schoolers now, my kids are among the older ones on stage, and the kindergarteners seem tiny – and adorable. Because this is such a small school, we get to watch the children – our own and everybody else’s – grow from wide-eyed, baby-teethed kindergarteners into self-assured pre-teenagers. The difference between the school’s oldest students and its youngest is perhaps nowhere more apparent than when they are all gathered together at the spring concert, just before those sixth-graders head off to middle school. School concerts are a combination of excited voices and singing ones, well-played instruments and squeaks, charmed laughter from the audience and heartfelt applause. It is perfect – and only occasionally painful – imperfection. The audience, though the faces change from year to year, is always a mix of parents and grandparents, older siblings who were on the stage not so long ago and younger ones whose turn is still to come, and a medley of other friends and family and teachers. The concert hall is the school’s gymnasium, which is also the cafeteria. For concert night, lunch tables are folded up and put away next to the kitchen. Folding chairs are rolled out and set up over the markings of the basketball court. This year’s event featured contemporary songs and old favorites, along with a sword dance, a wild Irish reel, and the weaving of long ribbons around a May pole. The theme was welcoming the arrival of spring, and it seemed apt to celebrate growing, blooming things in a place dedicated to helping growing children find their own ways to bloom. At every school concert, there is a song that gives me goosebumps – music will do that to a person – and at least one that makes my eyes go all watery. Tuesday, that latter song was Simple Gifts, a Shaker dance tune written 170 years ago and sung Tuesday by the younger children at school. The lyrics are of the joy and simplicity of being free and finding ourselves in just the right place. In a world that seems so often gone mad, what better, simpler gift, I thought, than to listen to children’s voices singing to a room full of people who love them? Original content by Meghan McCarthy McPhaul, posted to her blog, Writings From a Full Life. This essay also appears as Meghan's Close to Home column in the May 25, 2018 issue of the Littleton Record.